Tambourine (membranophone) is a musical pat, at, perkusis, and Islamists. Made of wood choices, then rounded and dilobangi use electric-powered lathe and shaped specifically. While on the next hole mounted tanned goat skin white. While the other hole is used for handrails. With the skills, expertise and patience in penggarapannya, it will result in one of the masterpieces of Islamic art in the form of a musical instrument called the Tambourine Islamists. And if beaten, would come out nan distinctive tone. A great tambourine instrument is a clear and loud voice. And again, of course, look glossy and exclusive. Because tambourine including one type of craft tangan_ as other craft, which should be finely, exclusive and artistic soul as well. Existence Kaliwadas-tambourine tambourine Bumiayu, Central Java, began with tenacity host Madali (late) and Mr. Toip (our father) in making these Islamic instruments in the era of 1940-1950's. At that manufacture tambourine arguably limited and only a pastime, on the sidelines of their busy farming. Buyers and connoisseurs distinctive voice is still limited to the old people and in the nearby area only. 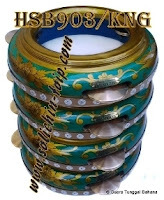 Its kind at that time there were only two kinds, namely Rebana Diba (Syrakal) with a diameter of 36-39 cm and Java Classic Glugu made of wood or coconut. Making body tambourine (kluwung) and Java while still using the manual method and the traditional method using Tatah (special knife) to design and melobanginya. It was still working with someone who comes from the Jatilawang, Banyumas, Indonesia. Only in the 70s-era parents we began designing the manufacture of body Rebana using foot-powered lathe (encouraged). Marketing tambourine was, in those days, still using the traditional way to distribute them door-to-door, dikelilingkan from village to village by the basket (marketing) only in the region of Central Java, particularly in the area of ​​Bradford, Tegal, Pekalongan and Banyumas. Also a small area of ​​Cirebon, West Java. Gradually tambourine craft away from reverberates everywhere, so a merchant (business) from Tasikmalaya named host Sulaeman deceased came to visit in the 1970's. He is the owner of a jewelry store or trinkets from the sea in front of the museum Bhahari Jakarta Fish Market. So watch tenacity and diligence of our father in fact the father of the maid Madali in making tambourines, so he then took her to work with his own business, providing free capital, and markets products through its stores rebananya located on the road to the shrine Foreign Rod Al-Habib Husein Abu Bakr ibn al Aydrus it. Later Solomon's store master store named Faithful. Well, then this is the end of the Faithful stores Kaliwadas-tambourine Tambourine Bumiayu which incidentally Toip products ranging widely known. Thus was born the Sentra Rebana Kaliwadas Toip products in Jakarta. And, apparently enthusiasm Jakarta Islamic society especially in the art of tambourine so great that two other businessmen in the fish market and then went along with the more market instruments designated as accompanist sholawat this. Later, the two entrepreneurs (Acep and master Zarkasy deceased) gave the name of his shop and store music Sinar Harapan Bali. Now three stores in the Fish Market Penjaringan, North Jakarta that management already in generation II respectively. Toip products are now management has been given to the children by bringing their individual brand, without losing Toip name behind it. In addition Syrakal tambourine and Java Classical, musical instruments made and sold now are many and varied, including: tambourine-dhurara Simtudh Hadrah al-Ethiopia, HabibSyech version, al-banjary, Salafudin (Pekalongan), variation or Mapsi (subjects and Islamic art), Diba with different versions, Bass, Jidur, keprak, Qasidah (Lasqi), Samrah, Hajir Marawis, various Drum, Drum, Marching Band, and even drum mosque, mosque and pulpit even have our own production. Tambourine heyday took place in the era of President Wahid Aburrakhman (Gusdur) in 1999 to the present. I was only one year establish their own business by forming a business entity Bahana new Single Vote registered in the Office of Licensing Services Integrated Brebes ago in 2010, as an individual company. Unlike in the early days we still carry the name of our direct Toip kelilingkan itself to local brass, West Java (read: Jurus Barakah Kyai Bag. II), now our market is much better, by getting cooperation music store music stores other (other than in the area of ​​Jakarta), Cooperative School, the coaches, and individuals from all walks of life in all parts of Indonesia (see: our agency). In addition to ordering through our network, more than a musical instrument buyers Solichin Toip products that come directly to the house (place of business) or order via the site or network website Facebook and our blog. Praise the Lord, musical instruments especially tambourine brand Solichin Toip, more widely known and recognized quality. In the midst competition other craftsmen outside the label Toip whose numbers already dozens of people and with price that more cheaper (read: cheapo, Red. ), We remain survive by quality, quantity and prices differ (read: Empat Alternatif Kualitas). So that national television Trans7 deign choosing and lifted the profile we inside event Laptop Si Unyil on 21 April 2010 ago. And on Ramadhan 1431 H. ago also local television RCTV Cirebon willing to work with us in organizing competitions Contests Genjring Ramadan 2. Now, as well as famous for its quality and sought after lover tambourine and lovers sholawat, it is a little outstanding products Solichin Toip asphalt aka real or fake. Even not a few unscrupulous-elements who claiming as the father of Toip, Solichin Toip or their brothers us which another for the convince prospective purchasers! Translated from the article Jurus Barakah Kyai Bag V by Google translate.